For those of you that don’t know, I’ve recently lost a bunch of weight (56 pounds!). To do this, I completely changed my eating habits. This included giving up fried foods (and fast food in general for the most part). At first I really, really wanted some KFC or Popeye’s fried chicken, but now (it’s been almost 7 months) I don’t want either of them. In fact, I don’t miss fried foods at all…except for these. My mom used to make these every once in a while when I was growing up and they are seriously delicious. They’re one of the first things I made when Zack and I moved into our apartment. Plus, the fact that they’re pretty easy to make helps. First of all, cut your potatoes into fries. You can totally peel the potatoes first or leave some skin on the ends. I personally like them with some skin on them, but Zack doesn’t like skin at all. It’s all personal preference. 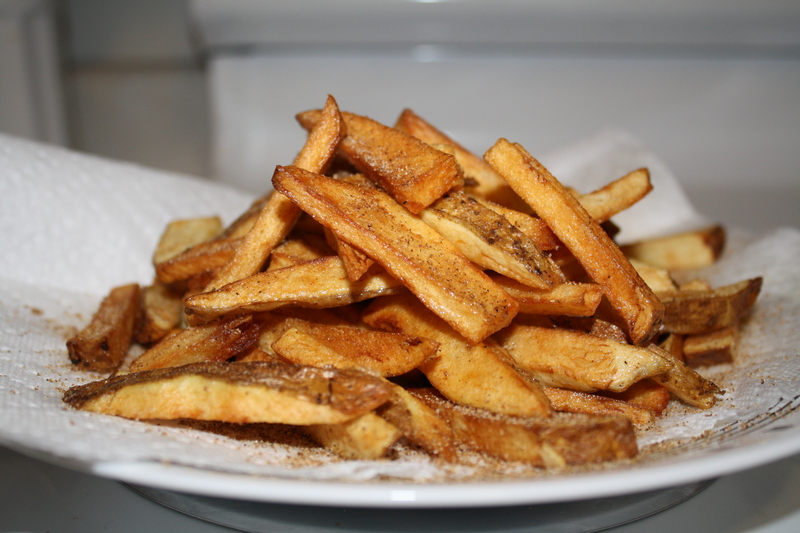 Next, soak the fries in the bowl of water for about fifteen minutes. While they are soaking, heat up the oil in either your Fry Daddy or frying pan. 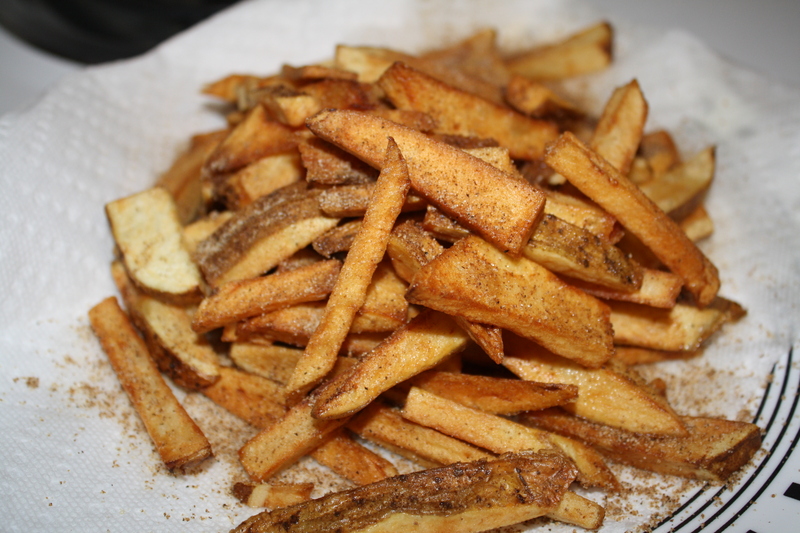 The oil should be deep enough to completely cover the fries in batches. After the oil is heated and the fries have soaked, put them in batches into the oil. There isn’t an exact science to determining how long they should stay in there, just until they turn slightly brown. Continue this until all are cooked. I let mine cool on a paper towel to absorb some of the excess grease. After they are all done, you can sprinkle them with salt and pepper, or Lawry’s Seasoning Salt like is shown in the picture.